Or, what if a sports columnist wrote that he prefers black athletes? Shades of Jimmy the Greek? It’s clearly racist because it plays on stereotypes that being of a certain ethnicity makes you better at something than people of other ethnicities. In retrospect, I probably should have used the word racist and not anti-Semitic, but then I would have gotten the emails arguing with me as to whether or not Jews are a race. Either way, it’s clearly playing upon the stereotype that a “Jewish Lawyer” is somehow smarter or better than non-Jewish lawyers. Offensive? Racist? Anti-Semtic? Anti-Gentile because they are saying non-Jewish lawyers aren’t as good? Whatever. Pick the word that you like best. The point remains the same. Other people wrote to me that the ad is legitimate because people of certain ethnic groups will often prefer to deal with professionals of the same group. For example, Jews would prefer a Jewish lawyer, blacks would prefer a black doctor, Martians would prefer a Martian Shmizlap, etc. I think that this may be true for older generations, but is probably not true today, for younger people. Even so, it doesn’t matter, because the “Jewish American Bar Association,” which remember, is a for-profit company owned by one person only who isn’t even a lawyer, isn’t marketing directly to Jewish people. If this were an ad in the classifieds of the local Temple Bulletin, and if the “Jewish American Bar Association” were an actual real non-profit organization and not a sham, I wouldn’t be as bothered. But by putting the bench directly across the street from the Courthouse, they are marketing towards the general population. These are the people who have jury duty, or who are going through divorce, or foreclosure, or who have a family member who is on trial, or who are involved in a personal injury case, etc. There are certainly Jewish people among that crowd. But if I had to guess, I’d say the percentage of Jews there is about 10%, which is approximately the percentage of Jews in Broward County, Florida. In other words, no fewer or greater of a percentage than the general population here. If they put an ad in the local Temple newsletter, then 99% of their audience would be Jews (with a 1% margin of error). Here, 90% of their audience are non-Jews. 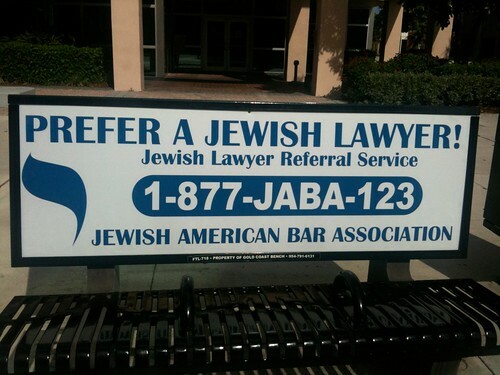 So the argument that the ad is ok because “Jews want to go to a Jewish lawyer” doesn’t work either. Just general. . . I have no other word for it than stupidness. You have to check it our for yourself, as I suspect that it won’t be up for long. Finally, I wonder who is eligible for membership? How does one prove to them that they are Jewish? I wonder if I’d have to show them evidence of my Bris.